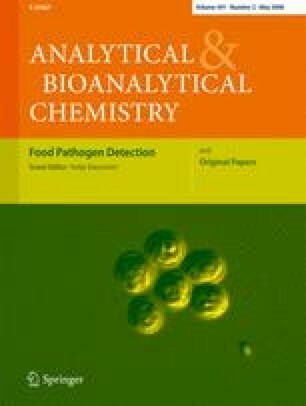 The interaction of ten natural polyphenolic compounds (chlorogenic acid, apigenin, catechin, epicatechin, flavanone, flavone, quercetin, rutin, vicenin-2 and vitexin) with human serum albumin and mixtures of human serum albumin and α1-acid glycoprotein under near physiological conditions is studied by capillary electrophoresis–frontal analysis. Furthermore, the binding of these polyphenolic compounds to total plasmatic proteins is evaluated using ultrafiltration and capillary electrophoresis. In spite of the relatively small differences in the chemical structures of the compounds studied, large differences were observed in their binding behaviours to plasmatic proteins. The hydrophobicity, the presence/absence of some functional groups, steric hindrance and spatial arrangement seem to be key factors in the affinity of natural polyphenols towards plasmatic proteins. The authors acknowledge the Spanish Ministry of Science and Technology (MCYT), the European Regional Development Fund (ERDF) (Project SAF2005–01435) and Generalitat Valenciana (ACOMP07–011) for the financial support. A. Diniz thanks the Coordenaçao de Aperfeiçoamento de Pessoal de Nível Superior (Capes)(BEX 1525/06–9) for the financial support. A. Diniz also thanks M.A. Martínez-Gómez for her teaching and unconditional support during all this work. L. Escuder-Gilabert is grateful to the Generalitat Valenciana for the financial support (APOSTD/2007/062).